No mês de dezembro 2018 participei da conferência sobre Maimônides “There was None Like Moses” realizada pela Biblioteca Nacional de Israel, Museu de Israel e Rambam Fund em Jerusalém entre os dias 11 e 13. Compartilho uma lista de reprodução da conferência em meu canal a qual estará sendo atualizada a medida que novos vídeos estejam disponíveis. 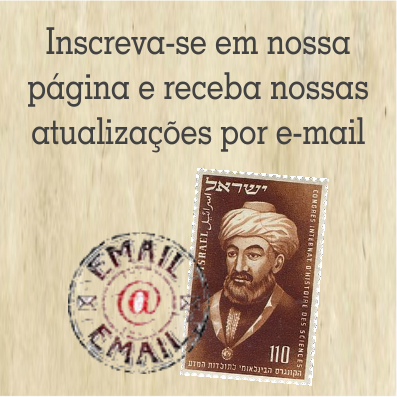 Esta exposição apresentou publicações criadas em torno da figura de Maimonides, desde a invenção da impressão até a era digital, e mostra diversos grupos que retratando seus próprios Maimonides para atender às suas necessidades e imaginações. O filósofo racionalista, legalista meticuloso, médico de renome mundial e líder comunitário ativo pode ter morrido mais de 800 anos atrás, mas o interesse em seus escritos e vida nunca deixou de existir entre judeus e não-judeus, do Iêmen e do Iraque à Europa e Américas. No entanto, vários públicos construíram para si mesmos um Maimonides que complementava suas sensibilidades culturais únicas, às vezes imaginando uma figura muito diferente de quem ele realmente era. Legados têm vida própria, e o próprio autor não determina como ele será percebido centenas de anos após sua morte. A exposição There Was None Like Moses é uma colaboração da Biblioteca Nacional de Israel e do Museu de Israel em Jerusalém com o apoio do Fundo Maimônides. Simultaneamente, o Museu de Israel apresenta a exposição Maimonides: A Legacy in Script, que foca os manuscritos únicos que contêm seus escritos. Meir M. Bar-Asher is Professor of Islamic Studies at the Department of Arabic Language and Literature at the Hebrew University of Jerusalem. His research interests include Qurʼanic exegesis and religious communities in Islam (especially Twelver Shiʻism and Nusayrism). A year ago his book, edited jointly with Meir Hatina: Islam: History, Religion and Culture, came out (Jerusalem, Magness Press 2017) and within the next few weeks his book Les Juifs et le Coran, is said to appear. Prof. Bar-Asher was the Director of Institute of Asian and African Studies at the Hebrew University of Jerusalem (2004-2006); and, Director of The Ben-Zvi Institute for the Study of Jewish Communities in the East (2012-2014). Dr. Meir Buzaglo is a lecturer in the Department of Philosophy with a focus on metaphysics, philosophy and Jewish thought. Among his writings he has written about Shlomo Maimon, and the connecting the logic of conceptual extensions. Meir is active in Israeli society and has worked on illuminating “Mesorati” (traditional) as an identity. He also serves as a trustee at the Keren Avi Chai. He has promoted renewing the tradition of the piyyut in Israel and recently wrote an essay on the metaphysics of the prayer of Shema Yisrael. He is the author of the book, A Language for the Faithful: Reflection on Tradition (2008) in which he tries to give a definition and positive meaning to the concept: “Traditional”. Carlos Fraenkel is a professor of philosophy and Jewish studies at McGill University in Montreal, Canada. He has published several works including From Maimonides to Samuel ibn Tibbon: The Transformation of the Dalalat al Ha’irin into the Moreh ha-Nevukhim (2007), Philosophical Religions from Plato to Spinoza: Reason, Religion, and Autonomy (2012) and Teaching Plato in Palestine: Philosophy in a Divided World (2015). Dr. Micah Goodman is an author and researcher of Jewish thought. He has authored four bestselling books: The Secrets of the Guide for the Perplexed, The Dream of the Kuzari, Moses’s Final Speech, and Cath 67: The Ideas Behind the Conflict Tearing Israel Apart. Goodman directs Beit Midrash Yisraeli – Ein Prat and is a research fellow at the Shalom Hartman Institute in Jerusalem. Zeev Harvey is Professor Emeritus in the Department of Jewish Thought at the Hebrew University of Jerusalem. He writes on medieval and modern Jewish philosophy, e.g., Maimonides and Spinoza. He is the author of Rabbi Hasdai Crescas (Shazar Center, Jerusalem 2010). He is an EMET Prize laureate in the Humanities (2009). Menachem Lorberbaum is Vice Dean of Humanities and Professor of Jewish Philosophy at Tel Aviv University. He has chaired the Graduate School of Philosophy and the Department of Jewish Philosophy at TAU (2004) and was the founding chair of the Department of Hebrew Culture Studies (2004-2008). Prof. Lorberbaum is also a founding member of the Shalom Hartman Institute, Jerusalem where he has headed the Bet Midrash program. He is author of Politics and the Limits of Law (Stanford 2001; Hebrew: 2006) and We are Dazzled by His Beauty (Hebrew, Ben Zvi Institute 2011). Together with Professors Michael Walzer of Princeton and Noam Zohar of Bar-Ilan he is a senior editor of the Jewish Political Tradition series (vol 1 “Authority,” Yale University Press 2000, Hebrew: 2007; vol. 2 “Membership,” Yale University Press 2003, Hebrew: 2018; vol. 3 “Community,” Yale University Press 2018). He is editor of the new and first complete Hebrew translation of Thomas Hobbes’ Leviathan (Shalem 2009). Prof.Lorberbaum is currently completing a study of Hassidism as a model of Jewish religious revitalization in early modernity and his book in first-order Jewish Theology, I Seek thy Countenance is currently i press (Carmel and Bar-Ilan). Omer Michaelis is a Visiting Scholar in Dept II of the Max-Planck-Institut für Wissenschaftsgeschichte and a Polonsky Visiting Fellow at Oxford Centre for Hebrew and Jewish Studies. Previously, he was a Visiting Fellow at Harvard Divinity School and Harvard Standing Committee on Medieval Studies. He submitted his PhD dissertation, “Crisis Discourse and the Dynamics of Tradition in Medieval Judaism,” at Tel Aviv University. Omer specializes in medieval Jewish thought and philosophy in the Islamic world. He focuses on the dynamics of production, transmission and integration of knowledge in medieval Judaism, and its intersection with parallel processes in the Islamic culture. His current research centers on the creative power of forgetting knowledge in Medieval Judaism. Sarah Stroumsa is the Alice and Jack Ormut Professor Emerita of Arabic Studies at the Hebrew University of Jerusalem. She taught in the Department of Arabic Language and Literature and the Department of Jewish Thought at the Hebrew University of Jerusalem, where she served as the Rector of the University from 2008 until 2012. Her area of academic focus includes the history of philosophical and theological thought in Arabic in the early Islamic Middle Ages, Medieval Judaeo-Arabic literature, and intellectual history of Muslims and Jews in Islamic Spain. Among her published works in English: Freethinkers of Medieval Islam: Ibn al-Rāwaādī, Abū Bakr al-Rāzī, and Their Impact on Islamic Thought (Leiden: Brill, 1999; Paperback edition 2016); Maimonides in his World: Portrait of Mediterranean Thinker (Princeton: Princeton University, 2010); Dāwūd al-Muqammaṣ, Twenty Chapters (Provo, Utah: Brigham Young University Press,2016); and Andalus and Sefarad: On Philosophy and its History in Islamic Spain (Princeton: Princeton University Press, forthcoming). Raquel Ukeles, PhD, is Curator of the Islam and Middle East Collection at the National Library of Israel, responsible for developing the collection and for building digital, cultural, and educational initiatives in these areas. Her major projects include: Jrayed.org: Digital archive of newspapers from Ottoman and Mandatory Palestine; Bustan writers-in-residence program for Arab and Jewish poets; and the publication of a multi-volume Arabic-English catalogue of Islamic manuscripts. Ukeles received her Ph.D. from Harvard University in comparative Islamic and Jewish studies in 2006. Prior to working at the NLI, she was an assistant professor of Religious Studies at Fairfield University and then academic director of the digital humanities project, “Intellectual Encounters: Philosophy and Science in the World of Medieval Islam.” Ukeles has published several articles on Muslim jurists’ responses to popular religious practices and a monograph on Islam in America.